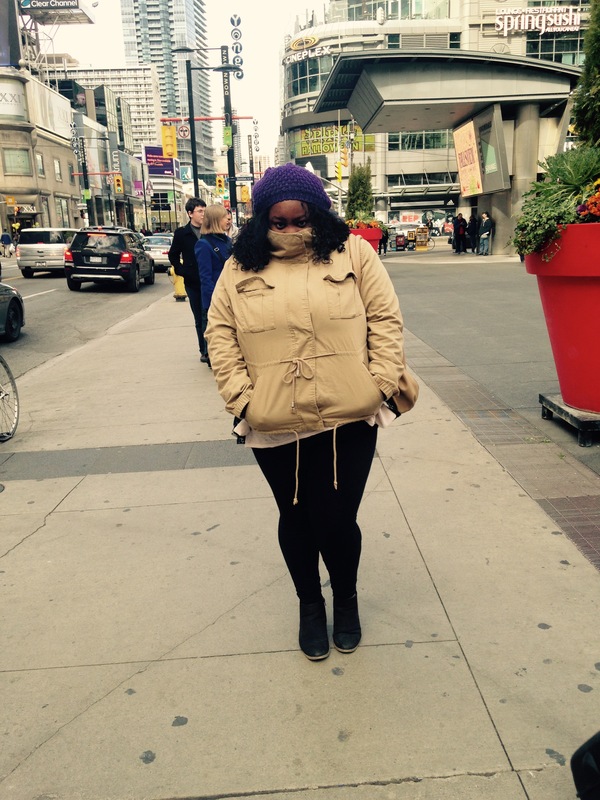 freezing my a-s-s off in Eaton Centre, Toronto. I recently had a very modern, yet probably kind of timeless conundrum: How should I celebrate my 30th birthday? I knew I wanted to get away from Washington, DC (where I live now), but I didn’t want to go somewhere like Miami or Vegas. Toronto seemed like a really good choice. I’ve wanted to visit for a few years, and I’m very obsessed with Drake, who is from there. Being an interloping member of October’s Very Own, it seemed like a very fitting trip. My sister gamely joined me, despite the average temperature hovering around 40 degrees Fahrenheit for the duration of our trip. We had a really great time, though, and ate so much amazing food. The only good way to recap our adventures is plate-by-plate, so here goes—12 really, really, really good things to eat if you’re ever in Toronto. Confession: I’d never had ramen! Unless you count the little packages they sell for a dollar at the grocery store. This was our first stop and it didn’t disappoint. The flavor was out of this world—earthy and rich. Mine came sans egg, though. We tried a bunch of little side dishes, but the the fried chicken was our favorite. It came out piping hot with that distinct, but hard to describe seasoning profile that seems to accompany chicken served at Asian restaurants. Yuuuuum. This pic does not at all do justice to how really tasty the crêpes were at this little stand on Dundas street. One aspect of Toronto I loved: the French influence. Besides having crêpes galore, we heard folks speaking French everywhere, and it was like music. This little food stand was smack dab in the middle of two must-see Toronto neighborhoods: Chinatown and downtown-ish. According to a sign outside, it had the best poutine in Toronto, so after we were satisfied with their crêpe preparation, we went back to try Canada’s national dish. If the pic makes it look a little unappetizing, tough, because that’s actually how it looked. It tasted good—not great—though. We had what was (in my opinion) better poutine at another restaurant, which I’ve mentioned further down. The day we landed in Toronto was my actual birthday, and I wanted to go to a really fancy restaurant. This place was in our hotel and it definitely fit the bill. It reminded me a little of Mr. Chow’s in New York in that it was super-fancy Chinese food. It felt familiar, but very elevated. Like our other food this day, this meal was a total win. I ordered what I always order—sesame chicken—and the sweet glaze totally set this dish apart. Imagine this: It’s your second day in Toronto, a Saturday, and you’re looking for a really amazing brunch. This is was us. And we found La Société. It came via a recommendation from a co-worker, who raved about a blueberry-goat cheese pancake. I’m thinking the menu here changes seasonally, because that delight was nowhere to be found, but another pancake-berry-frommage situation was available. I opted for a classic waffle with a ton of sides. It was a seriously decadent brunch and I highly recommend. Caution: It’s kinda pricey. I never mention price on this blog because a thing called the Internet exists, however this was sufficiently, surprisingly high-priced that I felt like I should warn you. We passed this place about a dozen times before settling on it for a late, weekend dinner. We immediately realized we should have stopped in sooner. It’s classic Japanese that’s really well-done—even in a city full of well-done Asian food. We ordered staples—sushi and teriyaki—and mini mouth parties were had with each bite. Apparently, the nostalgia’s authentic, as it touts itself as the oldest restaurant in Toronto. It’s also a local favorite, as there was a line nearly out the door on a Sunday morning. When we finally did get to eat, the food was very homestyle-y and just what you’d expect from a place with an “I Love Lucy”-style cash register on the counter. The home fries in particular were pretty excellent. Totally recommended for breakfast. So, there’s a cool little part of Toronto called the Distillery District. It’s apparently the biggest collection of Victorian architecture in North America (Wiki, thanks) and it’s getting a second wind as a shopping, entertainment and dining district with Old World charm. We stumbled on this area after a cold tour of the city and were super-anxious to find central heating and food. I say this to say not a ton of thought went into this restaurant selection, but it was a nice surprise. From the flight of (I think) local beers we sampled to the dressed up poutine we ordered to the main courses, it was super tasty, American-style pub food. After a tour of Niagara Falls, our tour group ventured to a small, historic town just outside of the famous waterfalls, where this ice cream shop touted itself as the best in Canada. I don’t think it really lived up to that name, as the cones were a bit stale, but it was really, really good, old-fashioned style ice cream. Did y’all know Drake was a restaurateur? We landed in Toronto at the perfect time to experience his restaurant just after the soft opening, but before it was flooded with masses of people. We stopped in for drinks on our last night in town, and were really impressed with the ambiance, the super knowledgeable bar staff and, in my case, the drinks themselves. The CN Tower is the most recognizable part of Toronto’s skyline, and a must-see if you’re visiting. It’s basically a super tall tower, from which you can see the most breathtaking views of the city. Following the advice of some really helpful TripAdvisors, my sister and I decided to have lunch at the Tower’s restaurant so that admission to the observatory would be free. Unpopular opinion: After you’ve had lunch at the very top of the rotating tower, snapping gorgeous pics of the city (see below) as you leisurely sip wine and snack on salmon, going down to the observatory to jostle with tourists for not-as-cool views is sort of a letdown. I’m so glad we decided to have lunch because I’m not sure the observatory would have been worth the money for just that experience. Now to the plate itself. A little mediocre. Maybe it’s just me, but super-fancy restaurants are almost always a bit of a letdown. Like, is any piece of seafood ever really worth like $50? But, my food was very enjoyable, the service was fantastic and the setting was so, so worth it. I couldn’t let the week go by without some sort of confectionery acknowledgement of my birthday, so we headed to Prairie Girl Bakery, a very popular spot downtown, for a round of fancy birthday cupcakes. The staff at 360 Restaurant was super gracious about letting us bring dessert, giving us a light and even holding the extra cupcakes while we toured the observatory. If you happen to be in Toronto for a celebration, grab a cupcake! The chocolate was super, super moist and tasty. Happy belated birthday! I’ve only been once but Toronto is one of my favorite cities! And I also love Drake! Your hair is gorgeous btw! thank you so much, laneé! glad you understand the drake love!